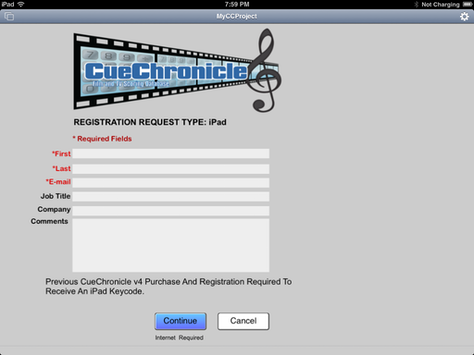 To open CueChronicle projects on your iPad downloadÂ the Free FileMaker GO 17Â app from the app store onto your iPad. Â Â Â Â Files can beÂ transferred using iTunes or iCloud. 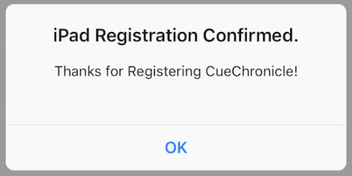 The file you will load onto your iPad needs to be a CPU or USB registered file, demos will not open on the iPad. The registered file can be created by any CC registered user. Connect your iPad to your computer and open iTunes.Select your iPad. 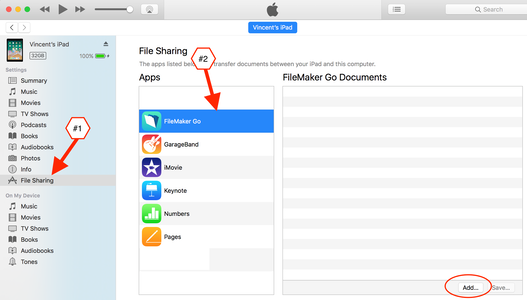 Add the CC file to the FileMaker Go documents list. 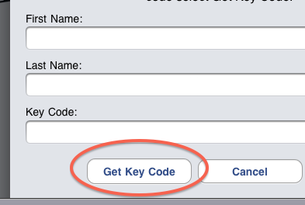 On the iPad open the email with your iPad key code and copy it. Close Mail an open FileMaker GO. The file you just loaded will be in the Files on the Device tab (#1). Tap the file to open it (#2). Â Â Â Skip to the next section if you don't have an iPad key code yet. Enter your First & Last names and paste in your iPad key code. The file is now registered and will remain registered to this device along with the other devices it's been registered on. 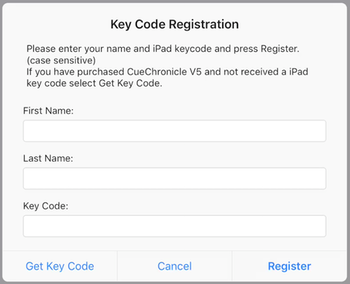 If you have already purchased CCv4 or CCv5 and haven't received your iPad key code yet, tap the Get Key Code button. re-open the file and use it to register the file as described above. Under Locations on the left tap iCloud. Then tap the CC file icon to download it to your device. The file on your iPad is a copy of the original file. Changes made to it will not be reflected in the original file. You can transfer the iPad copy back to your computer using iTunes.